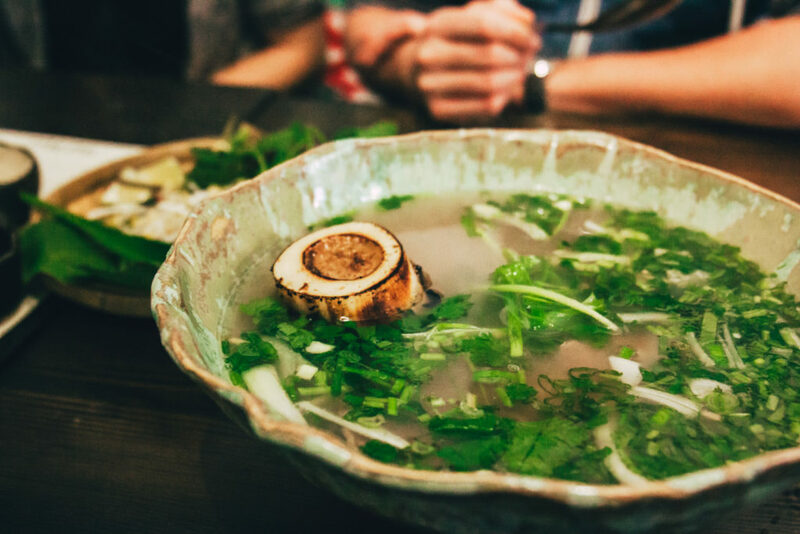 Today I invite you for a vietnamese pho soup at Vietnamka, a place where I’ve been twice and each time I had a completely different experience. In fact, that was my goal, because my first visit was immediately after they first opened the restaurant and I remember it rather as a failure. 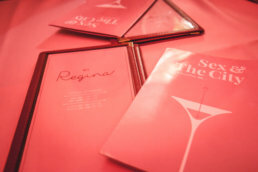 I wanted to give them one more chance, so recently I visited the restaurant again to check if something has changed. 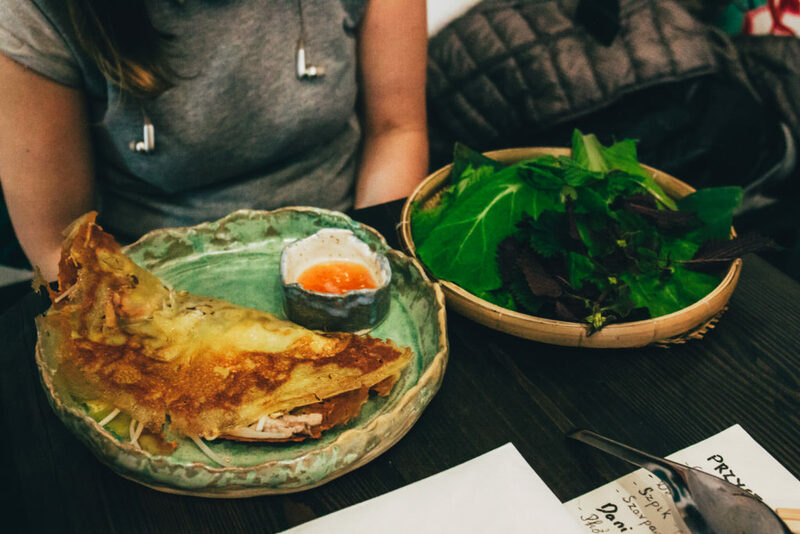 We went to Vietnamka for the first time after an enthusiastic review on the blog called Pyza Made in Poland. 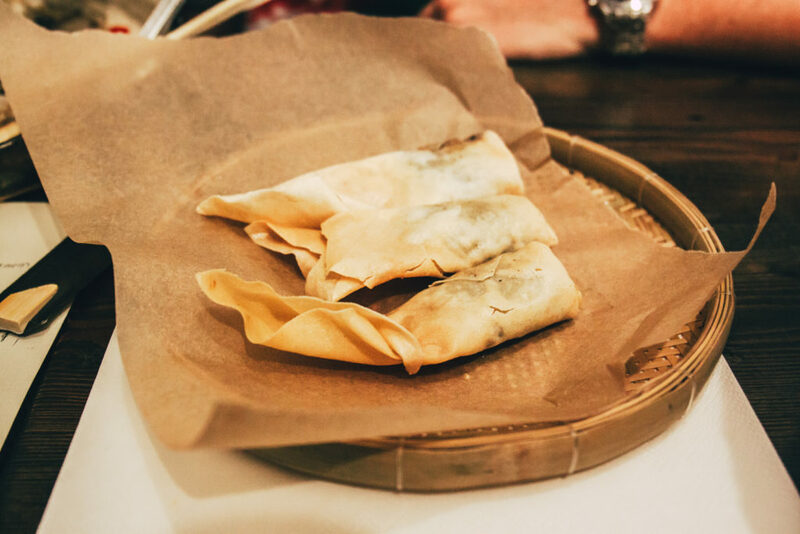 The author is an expert in the field of Vietnamese cuisine, therefore, when she recommends something, we believe her. We can’t really tell a difference whether something is authentic or not, but it also does not really interest us. We want it to be tasty. In case of Vietnamka it cannot be denied that the dishes served there are actually very tasty. Personally, I’m a big fan of pho soup so I ordered a meaty broth every time I visited. Especially since, according to the already mentioned blogger-expert, the soup served here is the best in Warsaw (officially the second place on the list, but number one is the place in Wólka Kosowska, so not really in the city). 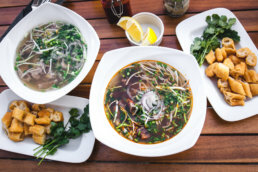 Is it really the best pho soup in Warsaw? I don’t know. I liked it a lot and personally (again, as a non-expert, only a food enthusiast) I would put it on par with the previously described pho from UKIM on Chłodna street. In both restaurants, Vietnamka and UKIM, I liked the fact that they serve you a plate full of herbs and leaves separately, so that you can add them to your soup in the configuration that you like most. I like all the vegetables, but there are those who react to the smell of coriander by leaving the premises, so it’s definitely a good solution. The first time I ordered pho with bone marrow, which, it seems, is no longer on the menu. It’s a pity, because it was very tasty, and the marrow itself, although I’ve tried it before, was still an interesting and a bit “exotic” experience. On my second visit I decided on a version of the soup with beef cooked in wine sauce. I definitely recommend this one as well. The meat is very good, but the broth itself is fantastic. 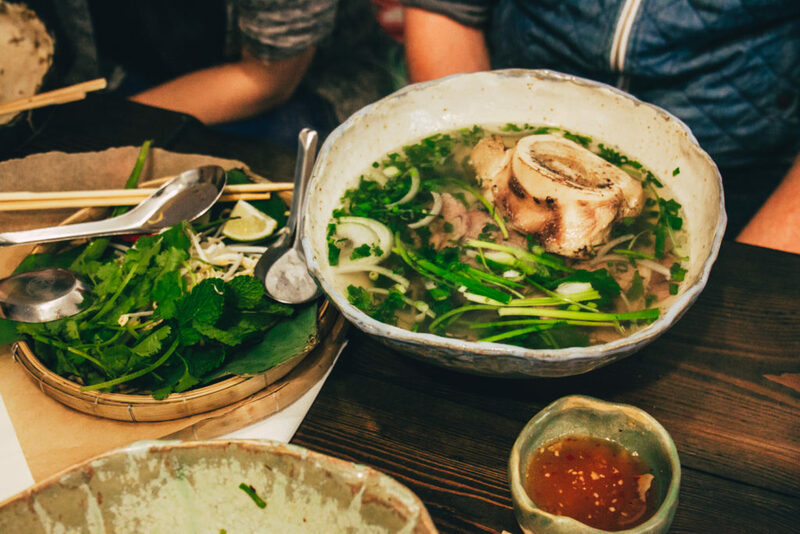 Plus the size of the portions are huge and it’s impossible for anyone to leave the restaurant hungry after consuming such a portion of filling pho soup. The problem with my first visit at Vietnamka is that although I recall the soup was fantastic, I had a much worse experience with the service, the time I had to wait to get my food, to be exact. Then we went when the restaurant was still new and people wanted to check it out (I think it was a week or two after they opened). Our mistake, however, was that we arrived there during the lunch break of many employees of the offices located nearby. And while finding a seat was not a problem, it was much more difficult to actually eat any food. We came in a group of six, but everyone got their dish at a completely different time. At first, we tried to wait until everyone got theirs, but soon it turned out that it’s impossible to do, because the soup started to cool down, and there was no hope for other dishes to arrive any time soon. Unlike those employees I mentioned, we did not start to argue with the staff saying that we waited too long. Therefore, regardless of the order in which people came to the restaurant, the first served were those who shouted the loudest. A controversial statement, is it not? Unfortunately, these are my experiences with this place. 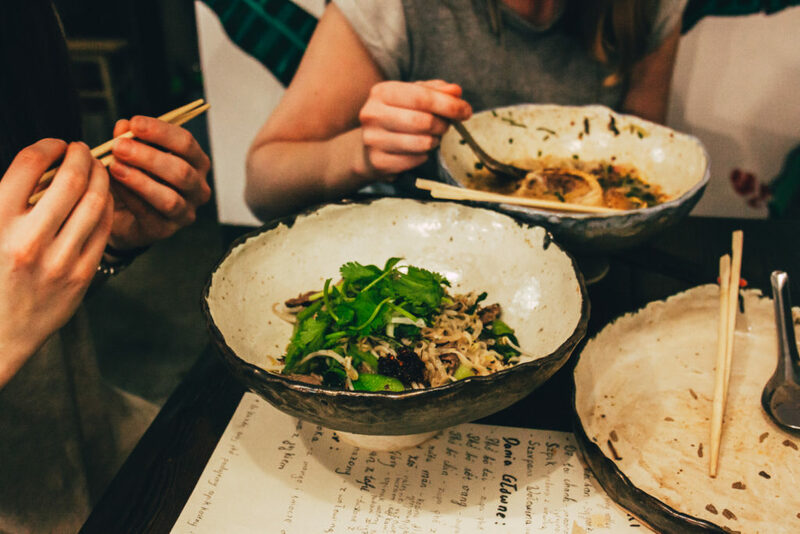 At Vietnamka the vegetarians enter hungry, but leave hungry as well. Each time I visited Vietnamka I was “with a vegetarian at my side” and each time she left unhappy. The first time the reason for the misfortune was spinach fried with chili, garlic and sprouts. 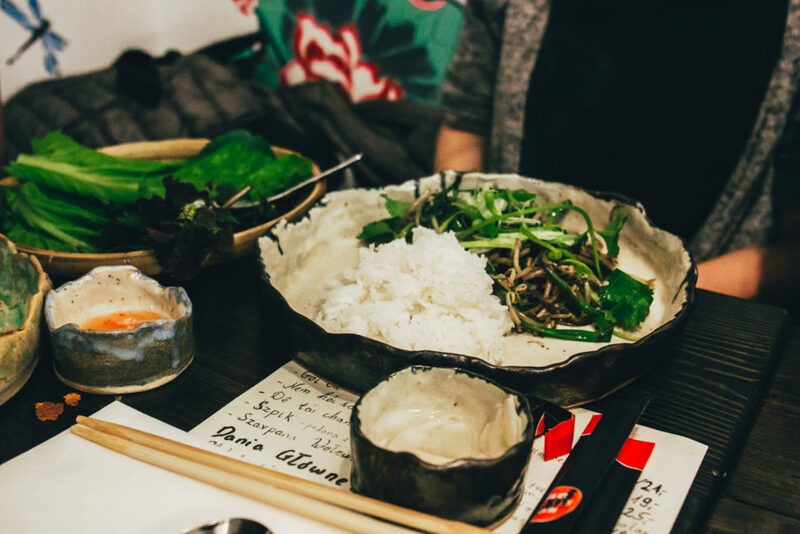 It is a portion of plain rice with greens, which you have to wrap into larger pieces of greens and eat like a pancake. The idea is nice, and it surely looks good, but unfortunately the portion is not very satisfying. Especially when the rest of the company eats huge portions of meaty soup. The second time was only worse. We came to the place at 6 p.m., so it was not super late, unfortunately the choice for the vegetarians was… non-existent. All the vegetarian dishes were sold out. Luckily Matilda does not have a problem with fish and seafood, so she ordered shrimps with tamarind sauce served with rice. Unfortunately, the portion of this dish was not sufficient either. She ate before the rest of us managed to devour half of the soup and started to look for places, where we can go for dessert, as she was still hungry. She ended up buying a sweet bun at a bakery straight after we left Vietnamka. I do not know whether I should recommend Vietnamka to you or not. My feelings concerning this place are ambivalent. 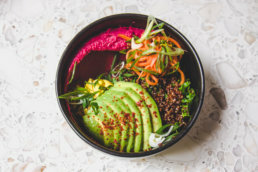 As for the soup, I definitely enjoyed it and would definitely order it again, but if you are a vegetarian, choose a different restaurant, because there is a good chance that you will leave hungry. Oh, because there are those who are outraged by the price of pho soup higher than 18 zlotys, just be aware that in Vietnamka prices are at a “restaurant level”. You will have to pay from 24 to 28 zlotys for a portion of soup. Anyway, all prices can be checked in the menu, available on their Facebook profile. The Cool Cat is getting better!